Pain is a major reason that adults avoid the dentist. 74% of Americans polled said that pain during treatment was the reason they don’t go to the dentist. But, many don’t realize that, like other industries, dentistry has evolved with the patient in mind. Today, many dental procedures are virtually painless thanks to tools like ultrasound at the dentist. An ultrasonic cleaner is used in dentistry, jewelry design, surgery, and many other industries. This is because of how effective the vibrations are for cleaning! Ultrasonic cleaners are able to vibrate tiny fragments of dirt, plaque, or other unwanted material from the smallest of spaces. An ultrasound at the dentist means you can have a pain-free dental cleaning! Traditionally, scaling and root planing is done manually and can cause irritation. As plaque builds up, it creates a space between the tooth and the gum tissue surrounding that tooth. This can wear down the bone of the tooth. Scaling goes below the gumline to remove plaque and tartar. A manual scaler removes plaque and tartar from between the gums and the teeth and down to the roots. Root planing smooths the tooth’s root and helps to reattach the gum to the tooth. This can involve discomfort, though. So, we recommend asking your dentist if they have an ultrasonic scaler, instead! The tip of the scaler is a thin tube that sprays cool water. When held against the tooth, the vibrations bounce against the tooth. This causes the plaque to break up and come off. The ultrasonic vibrations are so powerful that even hardened tartar breaks off. The water coming from the scaler then washes the broken debris away. Traditional manual scaling methods can damage the enamel of the tooth or bother the gums. Ultrasonic scalers don’t have this problem. 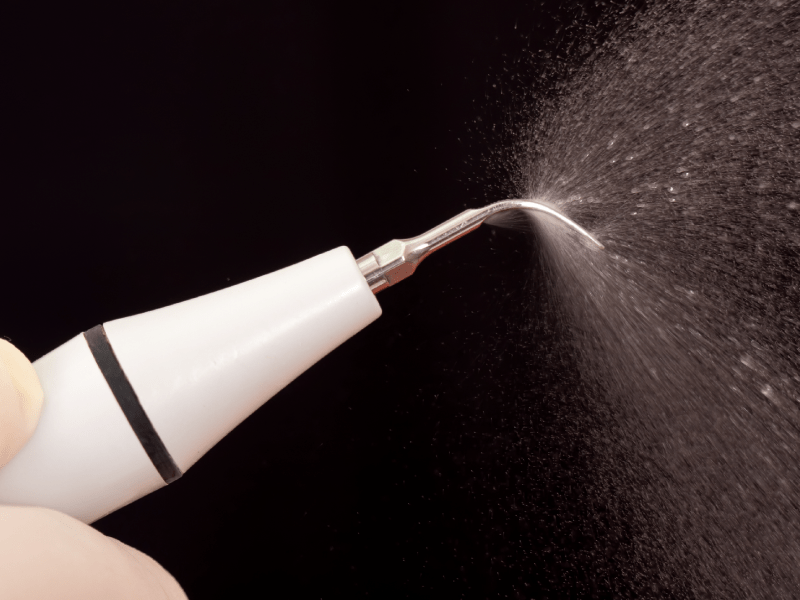 Using only the vibrations from the scaler, patients can expect a painless cleaning that’s more effective than manual scaling. Researchers are still finding new ways to use ultrasound at the dentist. Soon we’ll be able to leave our lead smocks behind with the x-ray machine. Ultrasonic waves are able to assess the integrity and strength of the internal structures of a tooth better than x-ray! Speak with your dentist about what tools they use for a painless patient experience, as each dentist has different preferences for their tools. Use this as an opportunity to get to know your dentist how they like to work; it’s the first step towards knocking that fear of your dental cleaning! We’re glad you enjoy it. The Ultrasound Device has to be among the top ways to get clean teeth, remove plaque and kill any bacteria in your mouth, and you really should try this innovative new Way. It is the first to use ultrasonic wave technology to help loosen and kill plaque and bacteria inside your mouth. Nice Blog…!! !